The U.S. Mint’s weekly sales report has arrived, with numbers updated to reflect sales through Sunday, August 23. 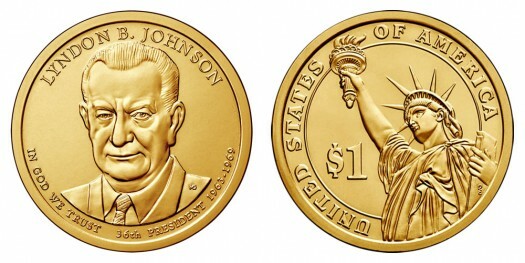 This week’s biggest numbers come from the 2015 Lyndon B. Johnson Presidential $1 coins, which were released in sets of 25, 100, or 250 pieces on August 18. The 25-coin rolls from both the Philadelphia and Denver Mints were the top sellers this week, moving 29,133 and 27,452 units, respectively. In 3rd place is the 2014 American Eagle One Ounce Silver Proof Coin, which maintained its strong momentum with 13,842 sales. Sales for the 2015 American Eagle Silver Proof Coin have slowed considerably over the last two weeks, perhaps because the item is currently on back-order from the U.S. Mint, with new inventory expected to become available around November 1. The 2015 American Liberty High Relief Gold Coin shows a negative adjustment for the second consecutive week, with a decrease of 1,081 sales from last week’s total of 42,441. The 2015 Dwight D. Eisenhower Coin & Chronicles Set also saw a small correction with a new cumulative sales total of 16,821 units, down 9 from the previous figure. The following statistics show total sales for the listed items through August 23, 2015. The first numerical column includes information from the mint’s August 16 report, the second column displays this week’s updated numbers, and the third column tallies the increase in sales over the last week. For more information on any of these items, visit the U.S. Mint’s online product catalog. 2013 Presidential $1 Circ Coin Set (P) ///??? ?